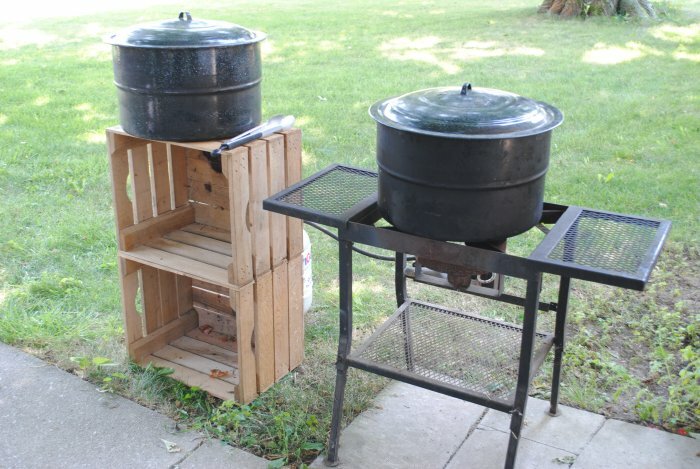 This weekend I dragged out all my paraphernalia to set up my outdoor canning kitchen. I set it up on the sidewalk just outside my kitchen door, and it will be getting quite a bit of use over the next few weeks. It’s a very simple setup, and keeps my house from becoming hot and steamy during the dog days of August. The burner/stand is from an old turkey fryer. I use one big pot to boil water for scalding tomatoes, peaches, corn, etc. The other big pot is filled with cold water, which I use to quickly cool said scalded tomatoes, peaches, corn, etc. From my staging area outdoors, I move my scalded/blanched produce into the house to finish processing. 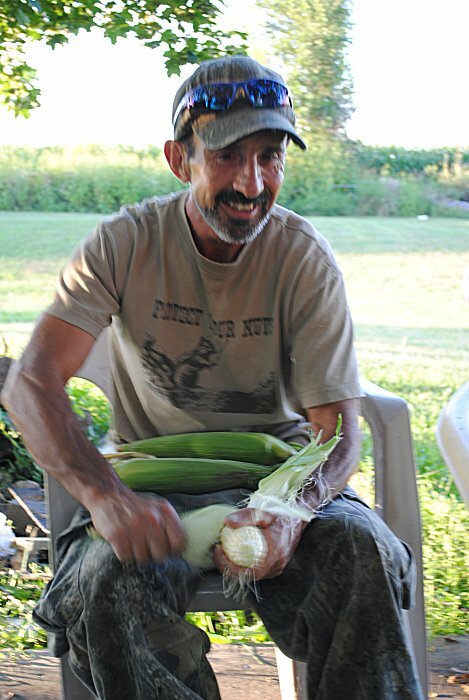 This weekend I’ve been working on a wheelbarrow full of organic sweet corn that was GIVEN to me. Yep, that’s right, it was free! I also got some help this time around. Since we moved our youngest son to college last weekend, my husband has been especially attentive to me, as we’ve been adjusting to our empty nest. I also got a little bit of help from the family cat. He’s always got to be in the center of whatever is going on around here. I finally had to give him a small ear of corn to get him out of my hair. 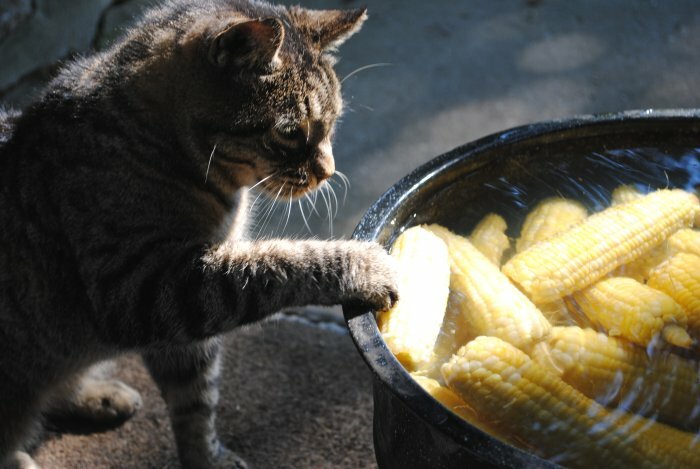 He’s a raw fed kitty, so who would have figured he was a sucker for sweet corn? My setup for cutting corn is very basic. I use a bowl turned upside down in a shallow pan and a very sharp, comfortable knife. I keep a knife sharpener handy, and run the knife over it every dozen or so ears of corn. 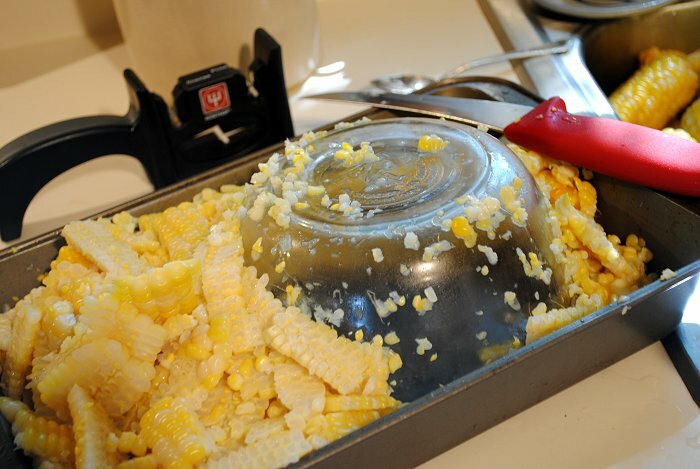 I use a regular sharp edged teaspoon to scrape the cobs after I’ve cut the kernels off. Once I have all the corn off the ears, I package it up in freezer bags, lay the bags flat on cookie sheets, and then stack the cookie sheets in my big deep freeze until the corn is frozen. 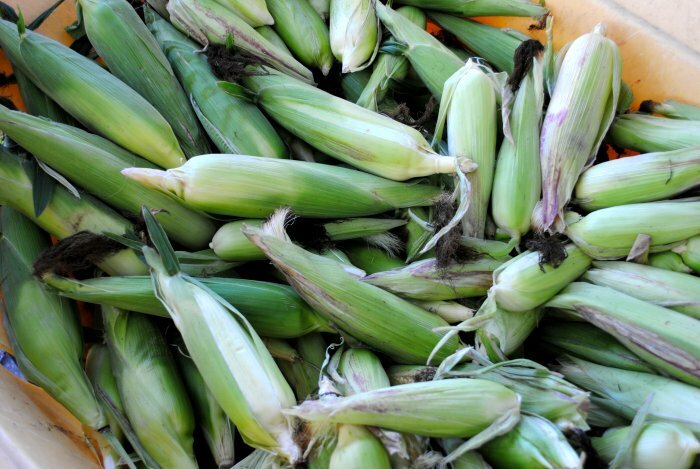 Now, I need to go finish the corn. I’ll let you know how much I end up “putting by” later in the week when I share some more of my canning adventures. I’m going to have close to 50 pounds of tomatoes to deal with on Tuesday.